Landscape Design in Ashland, Medford, and Jacksonville, Oregon. Banyan Tree Landscape honors the talent and experience of Landscape Designers work in Ashland, Medford, and Jacksonville, Oregon. We believe a landscaper is only as good as the landscape designer. That is why we are honored to have worked with some of Rogue Valley’s best. The Color combinations, the backdrops, the seasonal interest, texture layered upon layer, fragrance and beauty drawings the respondents of nature. Bustling birds, bountiful butterfly’s, or pollen covered bees to spread the fertility through your backyard orchard. Weather we use our in house design team of Andrew Markham and Lucretia Weems, or seek outside support from our beloved Sharron Creek, or even turn the project over to the esteemed Landscape Architects of Kerry KenCarin, Laurie Sager, or Bonnie Bayard, the true goal is to put together the right team and design for your project. I often take into account not only the nature of the project, but the goals, personality, and needs of the homeowner. I feel not one landscaper nor landscape designer is right for everyone. What is most important is a finished product that meets or exceeds the hopes of the client. Careful thought, years of experience and education, and considerable knowledge of local variations in site conditions gives to the proper forethought required in a professional landscape design for your home. I feel this picture is one of thousands that shows how beautifully two well placed and chosen plants can interact. Sharron Creek’s choice of “Purple Palace” Huechera also known as corral bells compliments the creamy varigated hosta in the backdrop. 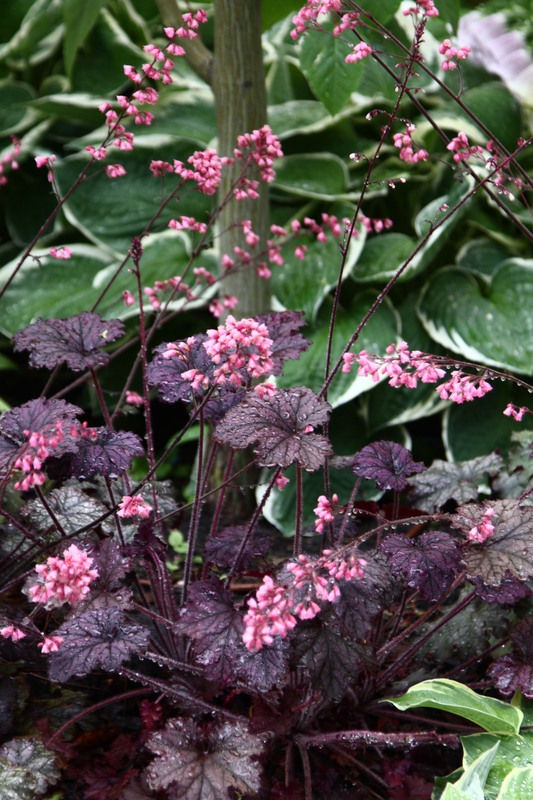 The delicate coral bell flowers reaching into the soft cool leaves of the hosta. The silver tints of the purple leaves tying in the cream colored variegation of the hosta. Colors that will make your dreams sweet and your days cool and comfortable. Landscape design in Ashland, Medford, and Jacksonville, OR is all too often overlooked. I see new landscapes with the same pallet of stock plants over and over. We cherish the process of design to create the right plant combinations to not only highlight your home but bring out the home owner’s character and spirit. Banyan Tree Landscape Construction llc is a proffesional landscape contractor company equipped with the right team for all your landscape needs. Please call Andrew Markham for a free consultation and site visit to your landscape (541.944.0943) and enjoy the numerous pictures within the highlights of our portfolio at banyantreelandscape.com/portfolio.